Some have called it the “shoulder season” in Nantucket; the fall months when peace returns to the island. You’ll meet more locals than tourists and enjoy amazing autumn weather. There is plenty to do even though it’s a bit quieter around here and below you’ll find 5 of our picks to enjoy! Cranberry Festival – This year marks the 15th anniversary for the annual Cranberry Festival, a popular time on the island. It will be taking place October 6th, 2018 from 11:00am-4:00pm, rain or shine. Take a trip to the Milestone Cranberry Bog where you can watch the berry harvest and take part in all kinds of fun activities. Parking is $20 per car but admission is free! Scalloping – Did you know that month of October kicks off the scalloping season here in Nantucket? If you hadn’t heard, the Nantucket Bay scallop is world famous! Not only can you enjoy them at many of the award-winning restaurants but you can also try your hand at catching some. Just keep in mind that you have to get a permit and in order to keep them they have to have a well-defined raised annual growth line on the shell. Biking – The heat has given way to some cooler temperatures, making it a perfect time to get out and bike around the island. Take a leisurely ride to some of the favorite spots around town such as Surfside or Sconset—just see where the bike path takes you! There are several bicycle rentals nearby on Broad Street and North Beach Street, or just ask us and we’ll help you find what you are looking for. Round of Golf – Many golf enthusiasts love to hit the green in the fall season as the summer crowds have dwindled and you don’t have to walk the 9 or 18 holes in blistering heat. The Miacomet Golf Club is a gorgeous local course that is open year-round. NantucketGrown Food Festival – This great event happening October 11-14, 2018, is four days full of food, fun and education. 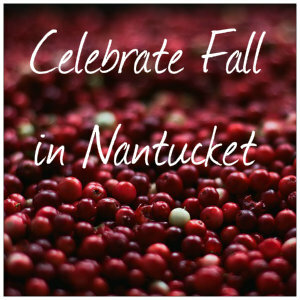 Enjoy dinners by award winning chefs, farm to table testing, Sustainable Nantucket Farmers & Artisans Market, scallop opening demonstrations, cocktail creations by Cisco Brewers, brunch at the Nantucket Yacht Club, and more. Have you picked one you’d like to do? Book with us online today or feel free to contact us anytime if we can assist in planning a special Nantucket fall vacation. This entry was posted in Fall by admin. Bookmark the permalink.